Growing up, I never liked the Big Mac. 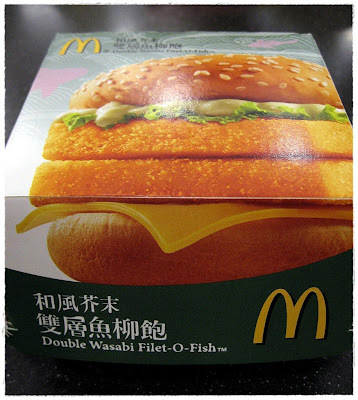 The Filet-O-Fish was small, but it was the tastiest for me. So when we were in Hong Kong and they had a special double patty, wasabi Filet-O-Fish, I thought I was dreaming. A Filet-O-Fish the same size as a Big Mac? And wasabi? Man oh man!! I love how the picture is always better than reality in food pictures, but the contrast was pretty funny this time. 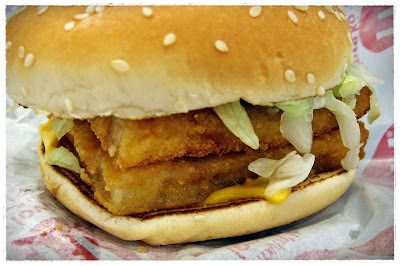 Notice how far the top bun is over to the left, and where's the wasabi tartar sauce oozing out? Ha, ha!! I have to say though, it did taste really good! !